This made me SO sad. Well done. Maybe Secret Life of Dresses #10 and this ‘un can go into town together and fill that prescription for anti-depressants. I love, absolutely adore the plisse dress. 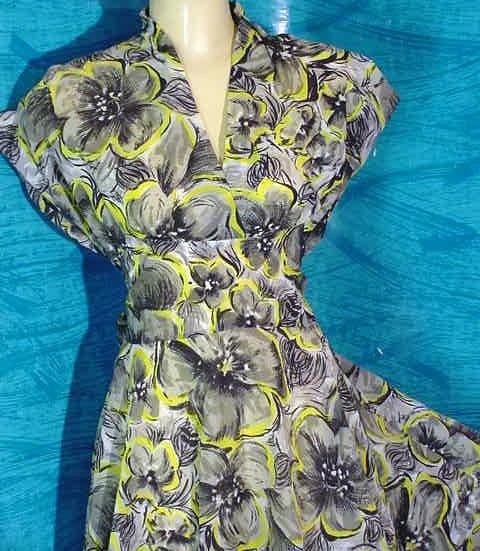 Of course, right now I’m a sucker for any floral print with chartreuse accents. This frock is the right price but the wrong size! Thank you, too, once again for another Secret Lives….11 is one of my many lucky numbers! Ohh… that was so pathetic… that poor lady…and her poor wonderful little dress. I’d like to pat her consolingly on the shoulder and offer her a cup of tea myself… and tell her to put on that happy dress and feel better… though having just lost someone myself I know that that doesn’t always work. That one read like a dress’s monolouge, to wonderful effect. They’re getting better and better, Erin. This was lovely. And not to bully, but do you still owe us drabbles? Because I greatly like these. I love your stories. Still waiting for the book to come out. You write beautifully. I meant it when I mentioned the book. I really enjoy these stories. Keep them coming. I am presently grieving the death of someone dear to me who passed away suddenly in October, and who had been a very big part of my life. So, from that point of view, I can say that in Secret LIves of Dresses #11, you capture very well the sense of what it’s like to experience that kind of loss. I second anonymous of 1:35 AM: Well done! Damnit. You kill me. Can I say that I love you? Damnit. Yes, very poignant, well written. But, darling, when is one of your dresses not going to be sad and depressed? I like to think that many of them have fun stories to tell. Beautiful, just beautiful! When are you compiling these into a book? I’d buy it! I don’t think this is a sad depressing story myself, just real. Oh my – I think I need a tissue now too. Love this. A friend of mine recently committed suicide and that story really puts into words all the feelings I have not been able to. Thank you. Please write a happy dress story next…maybe one about a dress coming out of the back of the closet for the first day of Spring. I really like the Koi fabric. It would make such a pretty dress with a full circle skirt. That fabric is just begging to be a dress! Ah, once again, you’ve done it! Thank you.As another commenter said, perhaps it’s time for a happy dress – what about the polka dot swing number? The one with the strappy red heels? Have you been talking to my psychiatrist? So touching, it took me awhile to compose myself before I left the house this morning. Now maybe a story about a happy dress, one the new Grandma wears when her daughter comes to visit with the baby. One with a lively print that the baby can’t take her eyes off, So Grandma makes one for the baby to wear, from the leftover fabric. What a sad and deeply emotional piece. Your stories get better every time.And I don’t know about forcing yourself to write a happy story… you can’t help what the dress tells you to write!I think at least we know that this dress had a happier past, and it cared about its owner!!! This was beautiful, as is the entire series. I’ve been deeply touched by more than one of these; thank you for sharing these with us. This could only be written by someone who has suffered her own terrible loss. My 18yo son died Aug 5, 2005 and that is just how it feels. Thanks for writing the words Erin. I won the e-bay auction on this dress, and maybe paid a little more than I should have because this story made me feel that the dress needed a loving home, where it would have joy again.When it arrived yesterday, I took it out and examined it. This is a hand-made dress, something that was not noted in its auction description. A real person, like us who gather here with Erin, made this dress. She picked out the fabric for this pattern. Her stitches are visible in the hem and where she put in the zipper. Some seams she used pinking shears on, others not. She was shorter than I, to judge by where the hem hits an odd place just above my knee.The bodice seam is a double curve, making a sort of corset line under the bust. The sash is long enough to wrap to the front before tieing.At the moment, the dress is holding pride of place in my closet. I think it needs black patent pumps. So amazing. Every once in awhile I get to read these, and I am just impressed by the beauty and emotion of your writing. Someday I hope you collect them, even if you just go up on lulu. Oh, please, please write a book of these! I will buy three copies straight off and come right back the next payday. i just happened upon this blog and was delighted to find “The Secret Lives of Dresses” and ended up reading every one of them. I loved them all. It is wonderful to come across such talent and entertainment amidst all the garbage that is on the internet. I look forward to reading more of your lovely stories. I just wanted to say that I’ve now finished all available Secret Lives of Dresses… I love it. Each one has made me cry a little, feel a little for each dress in my closet, and to want a LOT for you to write a book!! This is so sad. Lovey story..
Erin, I just found these Secret Lives tonight and I can’t stop reading them. But now you’ve REALLY made me bawl. You have so accurately described my thoughts and actions for the past six months after losing my husband to cancer. It’s comforting and yet a little scary how keyed in you are to someone who’s grieving the loss of a spouse. I didn’t move his shoes from in front of the family room stairs for months. Even now, I only moved them to the laundry room. And my clothes are probably sick of getting passed over for the black ones. Very well done. You certainly have talent to spare. Can’t disagree that these dresses seem to have depressing stories to tell, but then, if that what you feel like writing, then that is what you should write. I wear jeans myself. Very enjoyable and powerful story. God forbid that I ever feel like that. I haven’t really lost anyone that way yet. But I suppose that someday it will happen. I hope not soon at all. Not for many, many years. Wonderful story. All my dresses might feel the same right now. Since my husband died last May 1, 2011, I haven’t worn them; instead I am wearing black dress everyday until next year. Oh, fely — I’m so sorry for your loss.